For the slang term, see Beef (n,2) in Wiktionary. Beef is a type of meat that comes from cows. There are different types of beef. 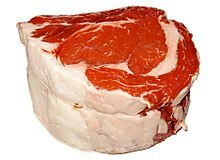 Beef is popular in the United States. Beef derives from the German word 'beife', meaning grazing beast. The Simple English Wiktionary has a definition for: beef. This page was last changed on 9 October 2017, at 22:29.